2010 Kikker 5150 Hardknock Frisco Bobber. Picture credits - Kikker 5150. Submit more pictures. The HARDKNOCK is a bobber in a traditional �old school� style featuring a springer front suspension, forward controls, jockey shift, electric start, solo seat, hydraulic disk brakes, and a chrome plated TIG welded 4130 chrome-moly frame. Comments: Customizable. Also available with 110, 125 and 200 ccm engines. The 200 ccm has a top speed of 75 mph. Ask questions Join the 10 Kikker 5150 Hardknock Frisco Bobber discussion group or the general Kikker 5150 discussion group. Bikez.biz has an efficient motorcycle classifieds. Ads are free. 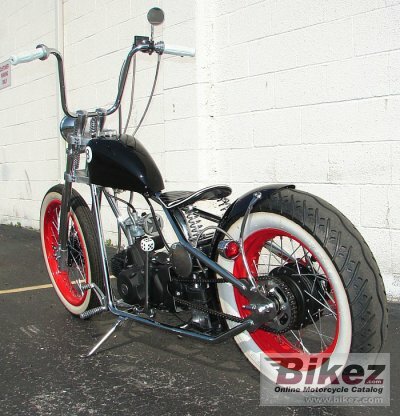 Click here to sell a used 2010 Kikker 5150 Hardknock Frisco Bobber or advertise any other MC for sale. You can list all 2010 Kikker 5150 Hardknock Frisco Bobber available and also sign up for e-mail notification when such mopeds are advertised in the future. Bikez has a high number of users looking for used bikes. Before you buy this bike, you should view the list of related motorbikes Compare technical specs. Look at photos. And check out the rating of the moped's engine performance, repair costs, etc.